ASUS took to the stage at Computex 2017 to announce a slew of notebooks, PCs and smartphones but in this article we shall be focusing on a product which did not get much attention at the event but was unusual enough to stand apart from the competition. ASUS launched an AC2600 router called the Blue Cave that immediately catches your attention with the big hole in its middle. 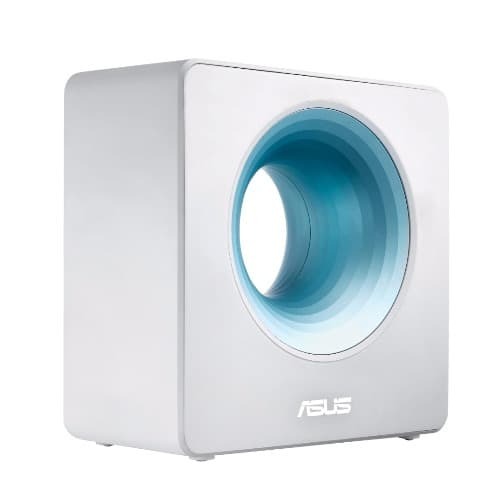 Most routers that are being sold today including the latest affordable addition, the Mi Router 3C have their antennas on the outside but the ASUS Blue Cave has its four antennas built into the device; to be exact, they lie on the top half of the hole. ASUS claims that this internal antenna design guarantees 20% faster Wi-Fi speeds. To make sure that the ASUS Blue Cave does not languish in obscurity at the back of your computer setup the company has added blue LEDs to the hole which makes it look attractive. The ASUS Blue Cave is backed by an Intel motherboard that can handle multiple connections without any hitch. The ASUS Blue Cave supports IFTTT which means you can pair it with other IFTTT compatible devices and apps and run automated task recipes. The ASUS Blue Cave comes with AiProtection that is aimed at protecting your devices against network attacks. The AiProtection is backed by a lifetime subscription of TrendMicro’s Smart Home Network that safeguards your smart and IoT devices against hackers. Just like many new AC2600 routers the Blue Cave has its own smartphone app that lets your monitor and control your network without having to log into your computer. This app notifies you about usage details of every device that is connected to the ASUS Blue Cave. The ASUS Blue Cave costs $180 and it will be launched globally sometime later this year.